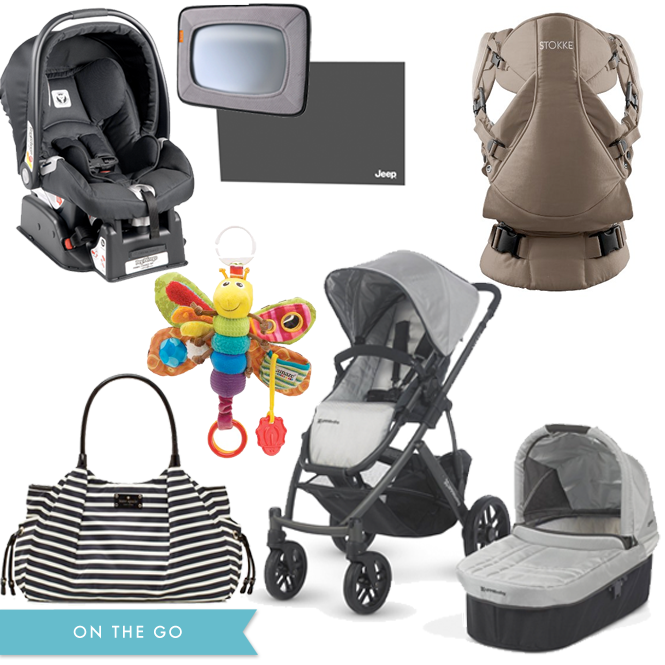 Car Seat - We have the Peg Perego Primo Viaggio SIP 30/30. I must admit that I didn't do much research on this. The horrors! It's only one of the most important safety items for the babe! But I have some friends that did the research so I just piggy backed on their work. Great seat but I will mention one thing that I didn't think about... pay attention to the weight of the carrier. The Peg apparently is on the heavy side of the spectrum and every pound matters once the babes get bigger. Mirror Have the Brica Baby In-Sight Mirror which does the trick and is a must for driving around! Easy to install, works in both my car and Andy's (both SUVs) and is soft just in case it falls. Sunshade - Jeep Sunshade (we don't have Jeeps) works perfectly. It's a cling style sunshade that sticks directly to the window. I like that you can cut it up to fit your window and the pack comes with two so you can customize accordingly. Baby Carrier - This saved me in the early days and is still great now. We decided on the Stokke My Carrier because it can be customized to fit different size people (I'm 5'4" and Andy's 6'3"); the baby can look in, out or be on your back; it has great weight distribution to make it comfy; ergonomically designed for the baby-- happy hips! ; it can be used from birth (in Thomas' case at least... 7.7lbs & 21 inches); and it has pockets so you can stash your card case and cell phone for quick errands. Stroller Toys - Thomas loves Freddie the Firefly but he also enjoys his mouse and his activity spiral along with plenty of other friends! Stroller - We went with the UppaBaby Vista and I love it! Our plan was to have Thomas sleep in his crib from the get-go. He ended up staying in our room for the first 5 nights home from the hospital (just. too. tiny.) and he slept in his stroller! I popped the bassinet onto the UppaBaby and he slept right in there cozied up to our bed (it's approved for overnight sleep)... Bonus I could roll it back and forth to soothe him. It worked great! Also great for napping while out of the house and on strolls. Like the UppaBaby because of the various attachments. The stroller is a base and then different attachments... bassinet, "toddler seat", and optional carseat carrier attachments. The base easily folds up with the toddler seat or carseat attachment still snapped in which is one less step. Again, Andy and I are different heights and the UppaBaby handle adjusts accordingly. Diaper Bag - I have the Kate Spade Stevie diaper bag and I love it. I actually have two because I scored a fabulous deal at the Kate Spade Outlet. Things I like-- doesn't scream diaper bag (I actually have the same bag in two smaller sizes), has a changing pad, has lots of pockets-- both exterior and interior, has stroller straps. I'm going to do a separate post on what I keep in our diaper bag. Bath - Pretty much a necessity to have a baby bath tub when they're so small and can't sit up. We have the Primo Bath Tub which I love but it's big! It's exactly what we needed because we don't actually have a bath tub (just a stand-up shower) and Thomas can be in this for a while. Towels & Wash Cloths - A hooded towel is great to keep their little heads warm after bath time. I love the Aden + Anais towel sets and the Peacock Alley towels. Both are big and soft. Some towels, while cute, are tiny and it's hard to wrap up the little wet one! Also love these bath puppets. They're cute, but they're also very functional because the mitt makes it easy to wipe down all the little baby folds and creases. 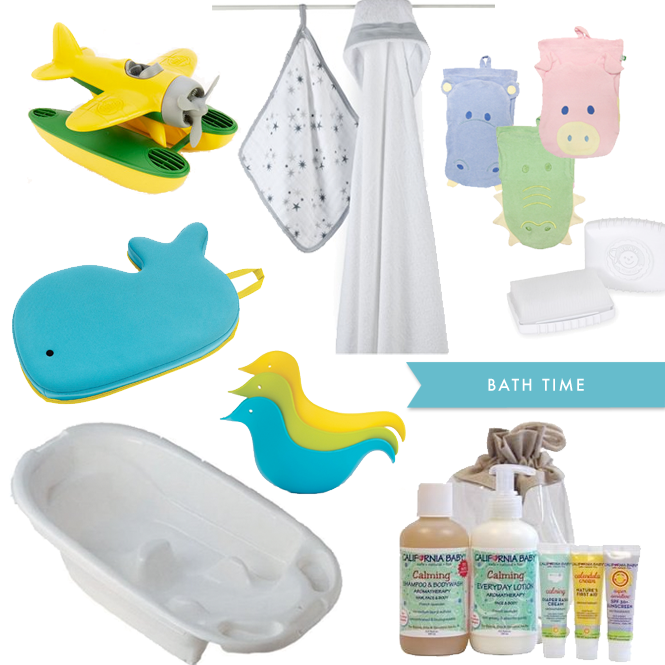 Bath Products - We love the California Baby products, especially the bath wash and the Mustela products, especially the foaming shampoo. And the Noodle and Boo products are great too and smell so precious (yes, when you're a baby, you can smell precious). And we diligently use our scalp brush to keep cradle crap (my name for cradle cap) at bay. Health & Safety Kit - It's a good idea to have an infant safety kit. Are you going to use everything in it? Probably not. Could you buy just what you need separately? Probably so. But this is an easy way to have some essentials on hand, especially the nail clippers! Etc - Skip Hop Dunks are cute and functional-- perfect for rinsing baby's head. The Skip Hop Moby Whale Kneeler literally saves my tush and knees every night. And then you have to have bath toys! Love the ones by Green Toys and Elegant Baby. Changing Table - You definitely don't have to get something that's specifically designed as a changing table. Another piece of furniture will work and will probably last longer. Things to consider: Height- make sure it's a comfortable height so you're not leaning over and killing your back. You spend a lot of time changing diapers. A lot of time. Storage- babies have a lot of stuff. 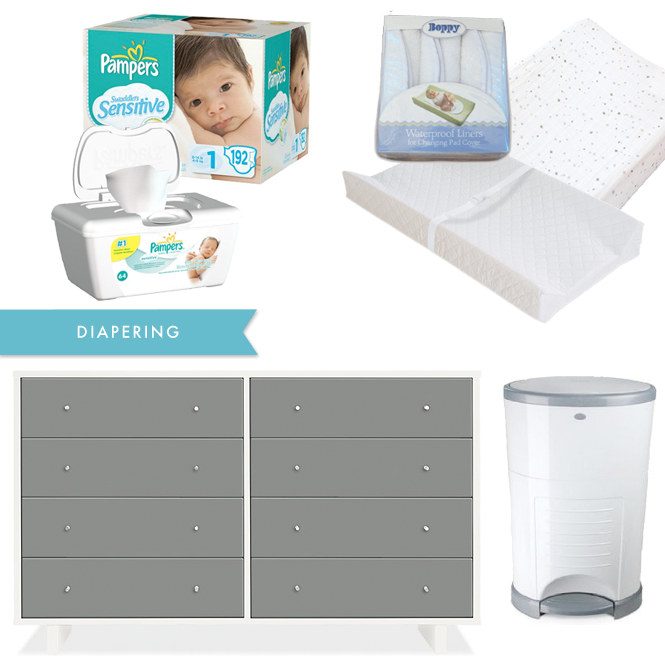 Surface Area- there's a lot of diapering gear that's good to have within reach. I love this Moda Dresser from Room and Board. Changing Pad - There are lots of them out there. We just have a basic one from Summer Infant. Changing Pad Covers - As I quickly realized that one changing pad cover won't do. We have plenty of covers and love the Aden + Anais covers. The Boppy Changing Pad Liners are also a must so you're not washing the covers all the time (you already do that enough anyway). Diaper Pail - We have the Diaper Dekor Plus. So far, no complaints. It's easy to use and never had any smell seeping into the room. That's all I can ask for! Sound Machine - Andy and I keep a white noise sound machine in our room, so I just got the same one for Thomas. The Marpac Dohm-DS Dual Speed Sound Conditioner is just enough white noise to drown out other sounds. Pacifiers - For the first three months, Thomas loved his wub-a-nubs. They were essential to him (and us!) getting sleep. Great thing about the wubbanubs is that they can rest on top of the baby's chest so they stay put for longer instead of toppling off. Now that he's found his thumb, he's not so interested in them any more but I'm sure that will change again soon. Swaddles - I think this is definitely a baby preference thing. I was convinced that Thomas would love the Woombie but he hated that thing more than anything, despite me trying at least 5 times (non-stop crying) before I gave up. For the first few weeks, I just swaddled him in the Aden + Anais Swaddle Blankets but by about 6 weeks, those no longer kept him snuggled up. Then we transitioned into the Summer Infant SwaddleMe which we liked and the Halo Sleepsack Swaddle. What's great about the Halo Sleepsack Swaddle is that you can continue to use it after it's time to stop swaddling the baby's arms. Thomas still sleeps in his Halo Sleepsack Swaddles with just his belly swaddled. One more note about the A + A blankets-- there's a reason you see them everywhere! They're great for swaddling, a light breatheable blanket, a carseat or stroller cover, a burp cloth, a nursing/pumping cover. Crib & Travel Crib - I think the crib for the nursery is definitely a personal preference thing. You obviously have to be mindful of safety concerns but if you're buying from a reputable company and it's a new crib, then you're probably good to go. We have the Moda Crib from Room & Board and I love it. Adjusts to different heights (think all cribs do? ), can convert to a toddler bed (this by no means was a necessity for me but I guess it's a bonus), looks great with or without a crib skirt. Then we got the BabyBjorn Travel Crib which is great. It is lightweight and packs up into a small case and is actually easy to assemble and disassemble. We've used it as a second crib when we have baby sleepovers and for T when he's at his grandparents' places. One thing to note, the mattress is on the floor level so it can be challenging to lay the baby down when he's asleep. Not a problem for me and Andy but just something to consider. Video Monitor - Not three days later and I already have an update. Actually a gross oversight! I can't believe I left off the video monitor. Maybe I'm just so used to it always by my side that I don't even notice it any more! We have the Motorola MBP36 Video Monitor. Totally spoiled by having a video monitor and now we're hooked. It is really useful if he's fussing and we can watch to see if he's just fussing and will go back to sleep or if we need to go get him. Like the Motorola version because it has the temperature of the room on there, it's easy to use, you can remotely pan the camera (very useful for our little wiggle worm) and you can talk to him! Bottles - We started with Dr. Brown's and have never had any problems so they seem to work for T. I read complaints that it's a lot of parts to wash but I don't know any differently so it doesn't bother me. The starter set was good for a while, but I did order three additional 8oz bottles. Then there's the drying rack for all the stuff and the bottle brush for washing. After using both, I prefer the munchkin bottle brush over the Dr. Brown's. Bibs and Burp Cloths - I didn't really understand the need for bibs until Thomas was a bit older. When he was a newborn, he rarely spit up or drooled (oh, those were the days!). I like the Aden + Anais Burby Bibs because they double duty as a bib that snaps around the baby's neck or as a burp cloth over your shoulder. I don't think you can ever have enough burp cloths. My favorite ones have been discontinued but there are plenty of "cute" ones out there. But also make sure to have on hand, the inexpensive cloth diapers for the really dirty clean-ups. Breast Feeding - I nursed Thomas until about 12 weeks and then started exclusively pumping and giving him bottles. This wasn't a planned out decision but just sort of happened. During those few early weeks, the My Breast Friend was a lifesaver. I have the MBF and the Boppy and much preferred the MBF while nursing. The Boppy was great for propping up T and keeping him cozy although he's now outgrown that phase. This Hellobee blog post sums up my feelings on the Boppy vs MBF. Pumping and washing bottles and parts is probably double the work, but it does provide more flexibility for me and I don't feel any less bonded with T. Because I spend a lot of time with my pump, I am so glad I went ahead and invested in the Medela Freestyle Breast Pump at the suggestion of a dear friend. The Freestyle combined with the Simple Wishes Hands Free Breastpump Bra (a gift from another dear friend) are the only reason I can keep my sanity while pumping. I haven't tried it, but I've read good things about the Arden All-in-One Bra. When Thomas arrived, I had no "toys" for him. I mean, don't babies just eat, sleep and poop a lot? Thankfully some kind friends and family sent along some and once Thomas was a few weeks old, these were invaluable for little distractions! Activities - The Wee Gallery Art Cards could entertain Thomas for a bit (long time in the life of a baby). The black and white seemed to be his favorite for the first three months. 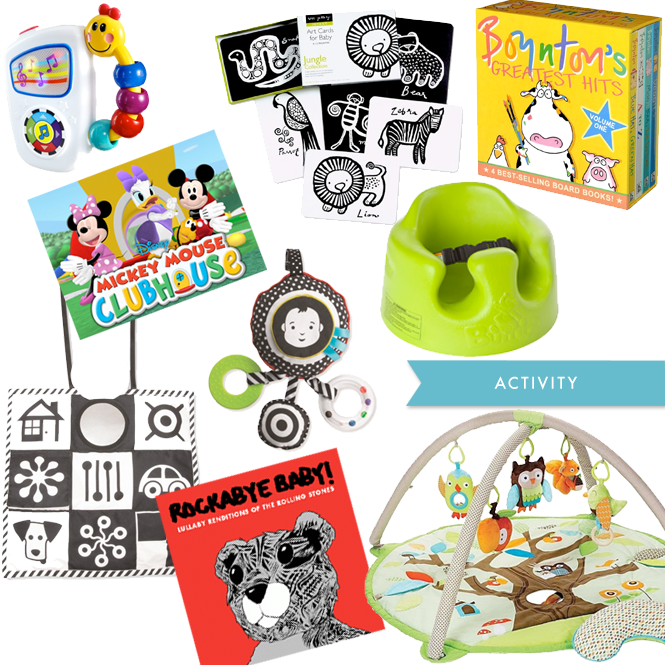 Also love the Wimmer-Ferguson black and white toys... activity mat and travel toy. Play Mat - The great thing about the playmat (we have the Skip Hop Treetop Friends version) is that you can use it from the get go. When Thomas was a newborn, he would snooze on his playmat, completely unaware of all his friends around him. Slowly he became interested in all the friends and now just wants to eat them all. He's practiced tummy time on the playmat and now loves to sit in his Bumbo and bat at his friends. Music - I quickly became annoyed by the made for kids music while I still wanted something geared towards a lullaby. A friend told me about Rockabye Baby and I quickly downloaded a few albums. It's lullaby versions (not just instrumentals) of popular music. We love the Rolling Stones album and some of the Journey songs. Also, now Thomas is loving his Take-a-Long Tunes for music on the go! Books - I love reading to Thomas and can't wait for him to be more into the stories! We really don't have favorite books right now since Thomas has no idea what's going on but I love the Sandra Boynton books because they remind me of growing up and they're short and silly for when T starts to understand them. Videos - I really don't like Thomas watching the TV. He just gets transfixed and it kind of freaks me out. I'm sure soon I'll be loving some TV shows for him (break for me) but for now, I definitely keep it at a minimum. We haven't watched any episodes recently but there were a few weeks when Thomas was around 10 weeks old that he had a serious late afternoon melt-down and the Mickey Mouse Clubhouse definitely helped me from losing my cool! Also, he loved to watch this Newborn Visual Stimulator video on my iPad.